Let's start with hyperbole, that I think is very true about Pepper's Adventures in Time: it is the best Sierra adventure game you, nor that many other players have never played. I know, I know, a lot of little-known games are praised as "the best thing ever", but before you tune out, hear me out why this forgotten edutainment game is one of the best titles Sierra ever published. Pepper Pumpernickel is a kid with aspirations of being a super reporter. She is hanging out with her dog Lockjaw when she decides to climb to the roof to see what her eccentric uncle is doing in the privacy of the attic of their house. To her surprise, her uncle Fred has created a "What if Machine" capable of changing the course of history, because he's fed up being called mad. So, Pepper ends ups, with her dog, to the colonial era America, where the things have gone wonky. Thanks to the meddling of her uncle, good, old Benjamin Franklin has been infected by mellow, groovy, party hardy hippie counterculture attitude, which he has spread all over the good people of Philadelphia, causing them to adopt the "I don't care"-attitude. And then, things get even worse, when after releasing Poor Richard, a fictive character invented by Franklin, the daughter of a scheming, greedy governor Pugh kidnaps Pepper's dog Lockjaw. What a pickle, don't you think? But as Pepper is a resourceful junior reporter, she soon finds a way to start setting things straight. The first thing to do is to find Ben Franklin and snap him out of the whole hippie attitude, then she has to help him to fix the people and finally, she has to get to the governors' mansion to rescue Lockjaw. The game is divided into multiple chapters. In each chapter, you are given the objectives you have to meet in order to complete it. You are also given things to keep a look out for, ranging historical facts, people and things you can get more information on by using a special "TRUTH" icon on them, which tells if something is real or fiction as well as gives additional information of the matter. 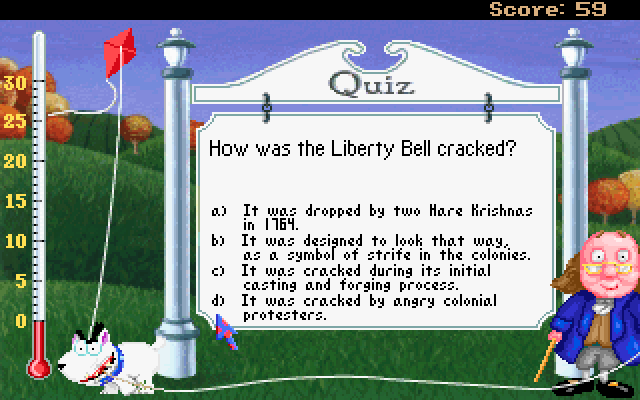 After each episode, you are given a quiz with 5 questions, which you can try to answer right in order to get more points. 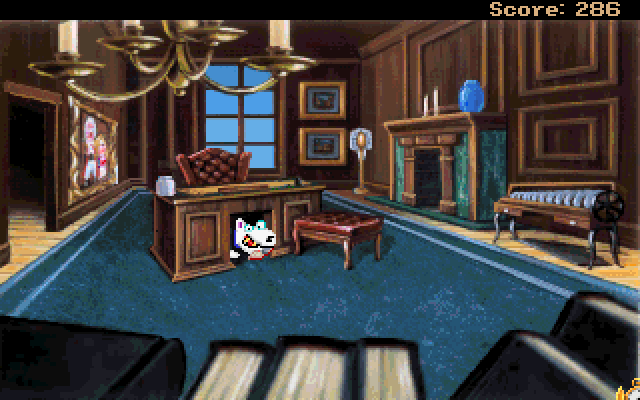 Unlike in other Sierra games, you get to play some parts of the game as Lockjaw. These short intervals are interesting, as you get custom functions, which include options for sniffing and biting stuff, both functions you can use to solve a couple of puzzles. As a cute little detail, Lockjaws inventory contains fleas. I don't know if you can use them in anything, but there they are. As far educational games go, this is a pretty smart system, as it does give, especially for younger players, or even older ones who are not up to their historical facts, more reasons to check out things in the game. Another interesting matter as far education goes is the possibility to check the meaning of certain words directly in the game. 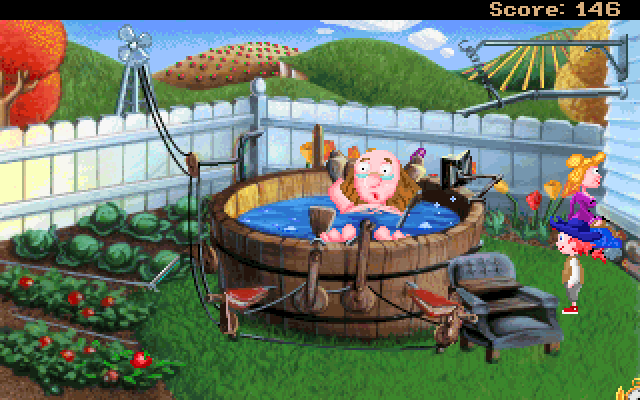 Educational games often have problems functioning as regular games, but against all odds, Pepper's Adventures in Time manages to be a solid point'n'click adventure on its own right. Not only are the puzzles mostly pretty fun, with a small caveat of a couple of puzzles which go a bit too far towards more traditionally moonlogic Sierra fare, but the writing and the design of it are more than solid. 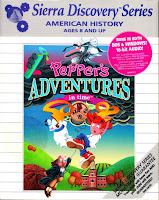 The design of Pepper's Adventures in Time is on the shoulders of Gano Haine, who had a hand in the first EcoQuest title, Jane Jensen of Gabriel Knight fame, Josh Mandel who had a helping hand with several Larry and Space Quest titles as well as some other Sierra games and Lorelei Shannon who also is responsible of the snappy, funny dialogue and text of the game. A final cherry on the top is the graphics and the music. 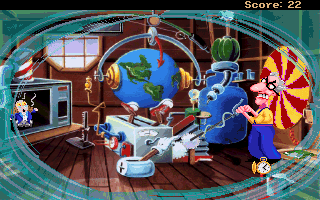 The art design is somewhat reminiscent of Lucasart's Day of the Tentacle. The aesthetic isn't quite the same, but the style does feel like it is taking water from the same well as far influences go. 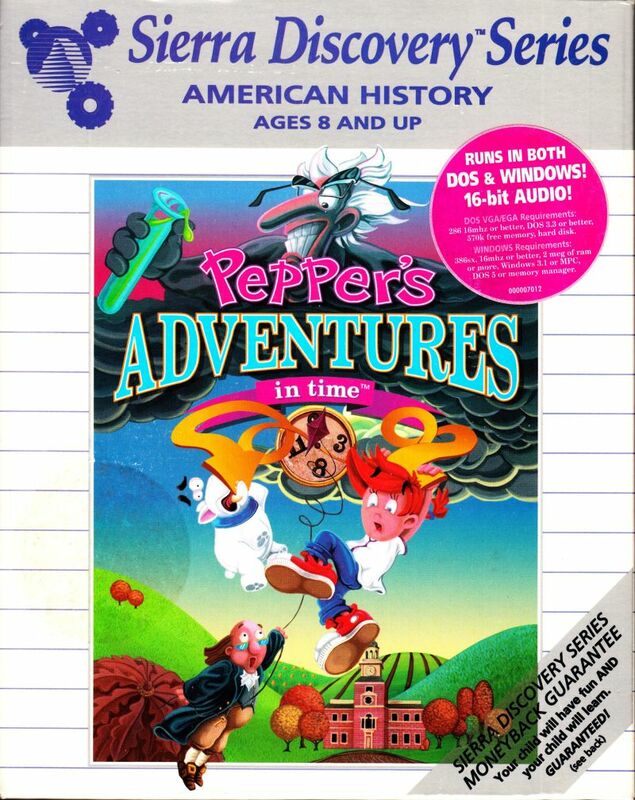 Sadly enough, despite this was clearly meant to be the first game in a series, Pepper's Adventures in Time wasn't big enough of a success to warrant additional games to be made. So while the game itself is great, it never did manage to find itself an audience from either schools or regular gamers despite being good for either case. If the failure of Pepper was because of the reputation edutainment titles had or if it was just because the time wasn't quite ripe for an edutainment title of this quality, I can't really say. Whatever the reason might have been, it is a shame we never did get more games to the series. At this moment you can't buy Pepper's Adventures in Time from anywhere at least digitally. You might be lucky in eBay or some such site, but if you really want a physical copy, you might end up paying far more of it than is sensible if you are just interested in giving it a spin and not an avid collector.